Dead Horse State Park - Oops, it was Canyonlands..! 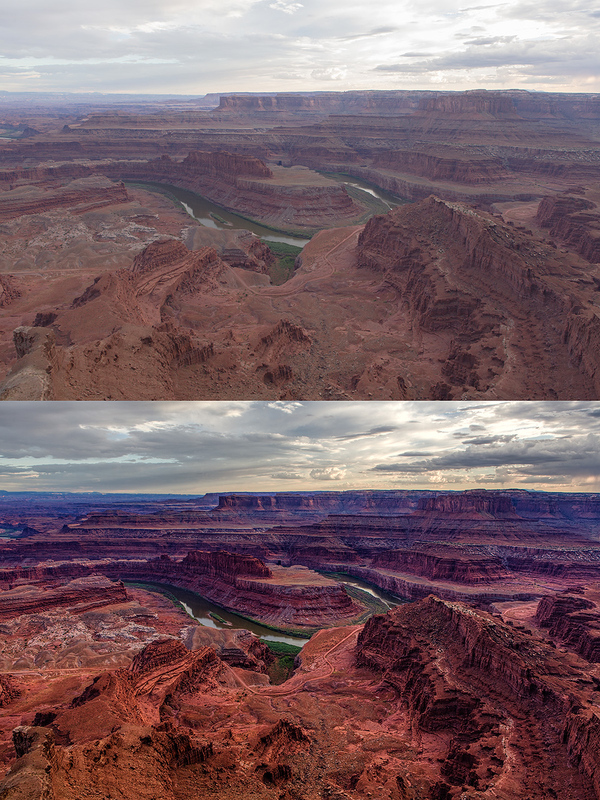 Luminous Landscape Forum > The Art of Photography > The Coffee Corner > Dead Horse State Park - Oops, it was Canyonlands..! Here is another shot from my 'Great American Road Trip' last October. I always assumed that Dead Horse State Park had been romantically named after an Indian Chief or something, you know like Sitting Bull etc., only to learn that it was actually named after a practice carried out by early foreign settlers to this region, who would corral wild horses onto a thin ledge above this canyon, then pick out the few horses that they wanted to keep, but then leave all the others to starve to death, simply because they couldn't be arsed enough to let them escape back into the wild...! You know what, I think there is a deadly virus that has been growing exponentially on this planet and that one day will completely destroy it and every single living thing on it, and that virus is us. I have uploaded this image into the CC section of this site BTW, because I think the landscape section should be a celebration of this world, but now every time I look at this image and the story behind the name, it depresses the hell out of me and so I didn't want to vent my depressive thoughts onto the happy people occupying the landscape section, but thought you guys in here where it can get a little more 'edgy' perhaps wouldn't mind so much - sorry if I have now depressed you too though..
You have a colour version? It would be nice to compare the two. In B&W it looks a bit bland. Yes of course I shot it in colour, but it was such a bland and overcast day, that the series of shots I took to make this pano, were all sort of blueish grey and not very inspiring at all. But if you read my previous comments on this image above, then I hope you will forgive me for not intending to work on it again, or even particularly wishing to look at it anymore. If you look and research far enough back in history, just about everywhere on this earth, that same virus has left it's mark. Too crunchy, contrasty, and constrained (composition). It is a depressing story. The location, however, is anything but. There, in one glance, you can see a thousand feet down, a hundred miles away and millions of years ago. It rivals The Grand Canyon. IMHO. So come on guys, surely one of you has got to be having a serious problem with your screen calibration, no? I totally agree Peter and it is a pity because I took quite a few shots in this area, but once I read the info board at one of the viewpoints, it sort of ruined it for me. Now should that be the case, I don't know, I can only tell you what I am feeling. Although in saying that, perhaps it is just me being old and cranky and having a depressive funk or something..
lacking strong features or characteristics and therefore uninteresting. I am happy with my description. Then please forgive me, as I misunderstood your use of the word 'bland' as meaning flat toned.. I've been there, and it IS an awe-inspiring view (even though most of my shots are taken from the "traditional" location) and there's a ton to find in the area. As for the story, I agree that it's tragic, and that people can be needlessly, horribly cruel, especially to animals, which harbor neither malice nor guile toward humans except inasmuch as they are creatures of nature, whereas we actively choose (or rationalize) cruelty despite the capacity to understand that we cause suffering. Here's my shot of Dead Horse Point state park. I travelled through the SOuthwest last April. I thought this area was better the Grand Canyon. 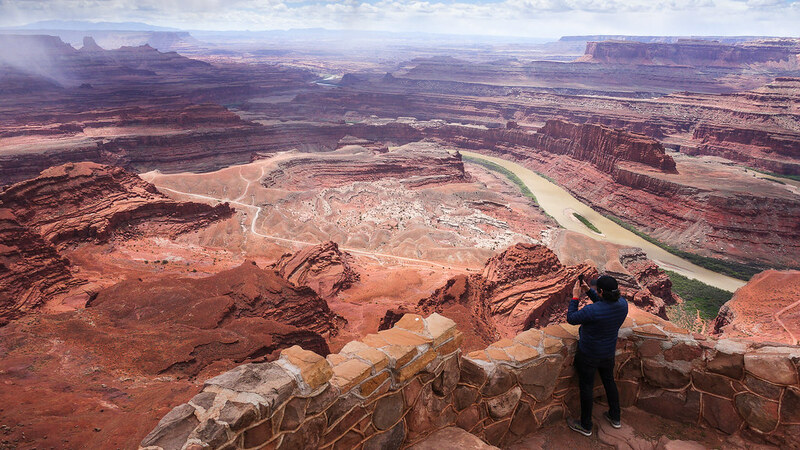 Note that the picture you took is Grand View Overlook and is not in Dead Horse Point but a little further down in Canyonlands. I'd encourage you not to let "bland and overcast" or depressing history get in the way of creating good images. Here's one of mine from a bland and overcast day, before and after. And even though your post is indeed Canyonlands and not Dead Horse, the encouragement still applies. 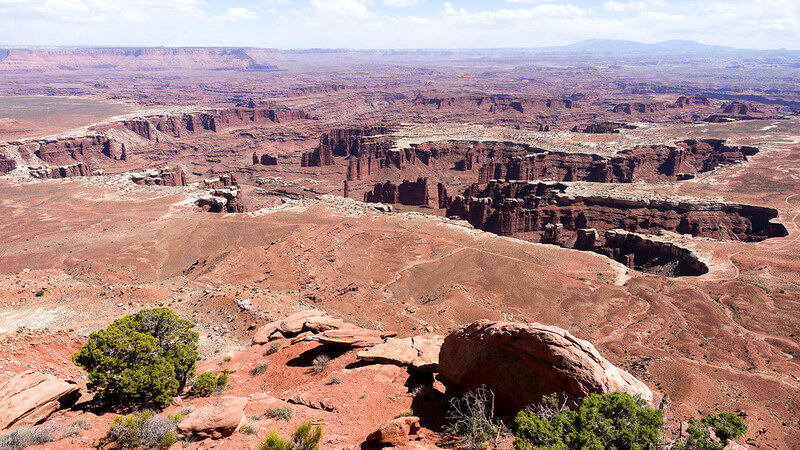 Re: Dead Horse State Park - Oops, it was Canyonlands..! Ok, enough is enough of this self-flagellation. You guys took a legend and ran with it. I strongly doubt the account. If anything, horses were considered almost sacred among all the animals in the Wild West. Horse thieves would be hung on the spot, because leaving another person without the horse was tantamount to sentencing him (the horse owner) to almost certain death. It is possible that something indeed happened that gave legs to the legend, but whatever happend was probably more due to unfortunate set of circumstances than stupid malice. Ok, enough is enough of this self-flagellation. Slobodan, I can't tell if you're joking or not, but "...sacred among all the animals...," I mean, really? Arizona, being part of the that "Wild West," has, not coincidentally, numerous horse rescue organizations. Maltreatment and abuse of horses is an old story, and even today those organizations have to keep soliciting money to continue taking care of and adopting animals as needed. I thought I made it clear what made them "sacred" at the time. Today is different. We do not need horses the same way people in the Wild West did (which, of course, does not justify the mistreatment). Unfortunately, I suspect that that legend is based on facts. In those days, for the early settlers the wild horses were more a nuisance and a renewable resource, so pushing them off the cliff seemed like a normal thing to do. Same with bisons. And the killing is still going on. The officer for the Rawlins, Wyo., division of the Bureau of Land Management spotted a mound of brown against the white snow. As he drew nearer, he realized he was looking at the corpses of three recently shot wild horses. Reed says it's not uncommon to find single corpses of horses that have been sickly and then shot out of mercy. But as he inspected the two young mares and one stallion, he concluded they could not have been killed with any good intention. Bison slaughter was even encouraged by the US government as a means of starving out Native American populations, which relied on the bison for food. In fact, hunting of bison became so prevalent that travelers on trains in the Midwest would shoot bison during long-haul train trips. Once numbering around 20 to 30 million in North America, the population of the American bison decreased to less than 1,000 by 1890.